"Someone in the misty, wooded Moonshae Isles needs hundreds of brand-new swords taken under guard from Sword Coast smiths to a certain place on the Isles. The swords are needed so badly, and their safe arrical is considered so unlikely, that someone is willing to pay adventurers a lot of gold - someone fairly important. Adventurers foolish enough to take assigments too good to be true (or merely desperate for coins) will soon find themselves embroiled in a drak and mysterious struggle against evil that will take them into sacred groves, crumbling castles, and through ancient magical gates to the halls of the High King - and beyond. This sourcebook contains background lore on the Moonshaes, a DM's delight of new monsters, magic items, and spells usable in any AD&D campaign and enough adventure ideas to keep the most energetic player characters seeking their fortunes in the Moonshaes for years to come!" "A would-be conqueror is raising hordes of undead insects beneath Wolover's Keep in the Veilstone Peaks. This evil being was once a lich, a powerful undead wizard... but that was not enough. Now something strange exists beneath the Keep, something repellent - and strong beyond measure. 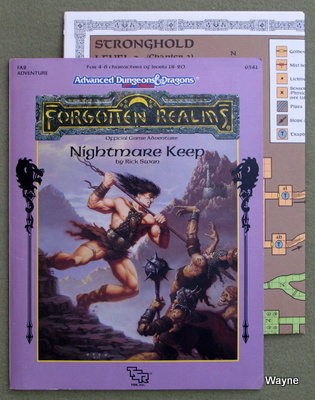 Nightmare Keep: for the AD&D game adventurer with courage, a strong stomach, and superior firepower. This adventure is set near northwestern Cormyr in the Forgotten Realms, but it fits easily into any ongoing high-level campaign." "A great evil force descended on the town of Phlan years ago. The townspeople were all either killed or driven away, and Phlan became (literally) a ghost town. Fifty years later, the survivors are ready to reclaim their town. But they need a band of strong and brave adventurers to lead the fight - they need you. 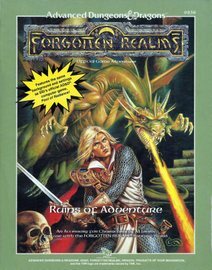 Ruins of Adventure is a set of connected short adventures written by James Ward, David "Zeb" Cook, Steve Winter, and Mike Breault - four names familiar to all AD&D game fans. It uses the same setting, locations, and characters as the computer game Pool of Radiance by Strategic Simulations, Inc. In fact, many of the scenarios here in Ruins of Adventure will provide important clues to the successful completion of Pool of Radiance." "Day breaks, and the crowing of a distant rooster wakes you from an all-too-short sleep. Another day of adventure, you think as you arise - but then you stop short. You, and all your companions, have an elaborate blue tatoo covering most of your sword arm! And there's more to these marks than a drunken prank. As you try to find out the source and the meaning of your new adornment, you are drawn further and further into danger and mystery. Will you become a pawn in somebody else's power game, or will you fight for your freedom and individuality? 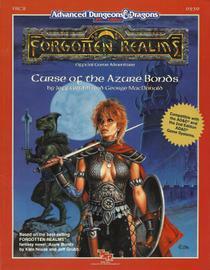 Curse of the Azure Bonds is an adventure set in the FORGOTTEN REALMS game world for the AD&D 2nd Edition game. It is based on the best-selling novel, Azure Bonds, by Jeff Grubb and Kate Novak. And watch for the Azure Bonds computer game, coming soon from Strategic Simulations, Inc.!" "THE GODS WALK THE REALMS. 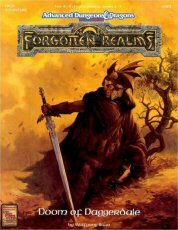 Cast out from their heavenly domain, the gods of the Forgotten Realms wander the land as mortals - extremely powerful mortals, to be certain, but mortals nonetheless. They seek the lost Tablets of Fate, key to their return. But as the good and evil gods of the Realms bring their fight down to earth, the people and lands are caught in between. Nature itself revolts: Strange creatures stalk the countryside, and even magic become unpredictable. When a band of adventurers are hired by a young apprentice to rescue her sorceress-mentor, little do they realize the size of the stakes they will soon be playing for. Caught up in a power struggle that will determine the fate of the Realms themselves, the first step is to find the only mortal who may know what's going on - the legendary sage Elminster. And that means going to Shadowdale. 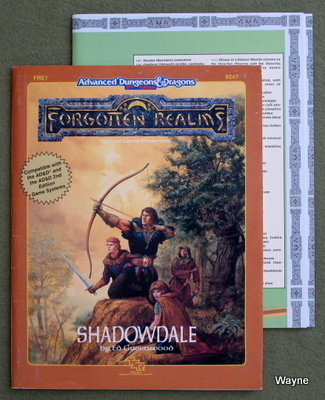 Shadowdale is the first of a three-part series of modules for the ADVANCED DUNGEONS & DRAGONS 2nd Edition roleplaying game. Set in the popular FORGOTTEN REALMS game world, this module features the same settings and many of the same characters of the first novel of the Avatar Trilogy, Shadowdale, by Richard Awlinson. 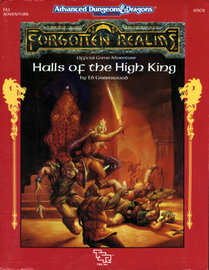 This AD&D 2nd Edition adventure is for four to six characters of levels 5-8." And to make matters worse, the player characters who helped to save Shadowdale from the armies of Zhentil Keep in Shadowdale (FRE1) have been sentenced to death for killing the old sage. They're innocent, of course, but in this time of troubles in the Realms, truth and justice are not always served. Imprisoned in the Tower of Ashaba, the heroes must escape if they are to survive! Later, when the heroes start their quest for the first of the mysterious Tablets of Fate - mighty artifacts stolen from the overlord of the gods himself - they come up against an even greater peril: Bane,the God of Strife, and his ally, the God of Death, have set in motion a plot to capture the heroes and their companions. You must face deadly assassins, nightmarish monsters, and violent storms on your way across the Dalelands. And the worst threat of all is an unexpected one - the man who helped you earlier has now joined the side of Bane and the forces of Zhentil Keep. 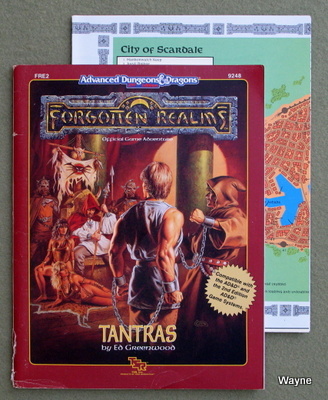 Tantras is the second of a three-part series of adventures for the ADVANCED DUNGEONS & DRAGONS 2nd edition roleplaying game, but it can also stand alone. Set in the popular FORGOTTEN REALMS game world, this adventure is loosely based on Richard Awlinson's Tantras, the second novel in the Avatar Trilogy. This adventure is designed for four to six player characters of levels 6-9." "The God of Strife is dead, destroyed in his attack on Tantras, and Midnight and the player characters have recovered the first Tablet of Fate - one of a pair of mysterious artifacts that will return the gods to their former glory and save the Realms from the fallen deities' wrath. But the quest isn't over! To find the other Tablet of Fate, your heroes must travel across Faerun to Waterdeep, the City of Splendors. But both Midnight's former ally, Cyric, and Myrkul, the Lord of the Dead, want the tablets for their own dark ends, and they will stop at nothing to capture Midnight even if it means the destruction of the Realms! 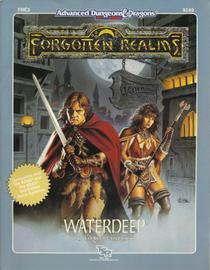 Waterdeep is the third of a three-part series of adventures for the ADVANCED DUNGEONS & DRAGONS 2nd Edition role-playing game, but it can also stand alone. Set in the popular FORGOTTEN REALMS game world, this adventure is loosely based on Richard Awlinson's Waterdeep, the third novel in the Avatar Trilogy. This adventure is designed for four to six player characters of levels 6 to 9." According to Jean Rabe, one of the authors, Chult was to have two color fold-out maps. The missing map was never published and the original is believed to have been lost to the sands of time. Several encounter locations in the module reference this missing map. Note that there is a problem with this listing on Amazon. 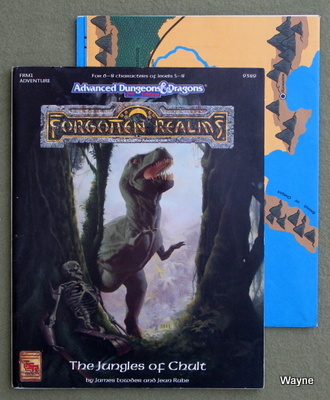 Some overworked copy editor at TSR mistakenly used Chult's ISBN (1560766050) in the booklets that make up the Forgotten Realms Campaign Setting (2nd edition). So now used book sellers come across the loose FRCS books - which were never intended to be sold separately - and mistakenly list them here. "Come, all ye seekers after treasure beyond your ken and adventure greater than any you can dream! Come, all ye mighty warriors, seekers after prey worthy of your peerless skills, and stalk the Children of Ubtao. Walk the streets of the city of Mezro, of the Maze of Life. Meet the barae, the holy warriors of Ubtao, those men and women who will live forever sustained by their wisdom and their faith. Wizards, be prepared for new magical spells and new methods of magic use based on gemstones. Search the jungles of Chult for the fabled emerald mines, for the Heart of the Jungle, a single gem as large as a man's heart. Also within these pages are new monsters and new character kits: Mage hunters, specialty priests of Ubtao, and spiritlords. This adventure is designed for 6 to 8 characters of levels 5 to 8." "Welcome to the picturesque village of Eveningstar, nestled at the foot of the Stonelands where the River Starwater winds down a gorge and snakes into the King's Forest. Here, the Knights of Myth Drannor began their famous adventures. Here, the Ladies of the Brazen Blade, The Company of the Singing Sword, The Steel Shield Band, and many others came, clutching royal charters from King Azoun with the ink scarcely dry on the parchment. Some fell, some went on to greatness - but they all came here first: here, to the Haunted Halls. * A challenging introductory-level dungeon. * A detailed countryside setting, including important local personages, local color, and guidelines for play. * Suggested campaign plots and adventures. A splendid campaign can begin here. Adventurers in an ongoing campaign can stop by for a memorable visit. 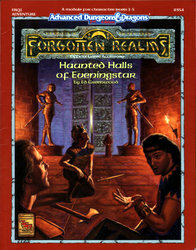 Those looking for an underground stronghold may even find a home in the Haunted Halls of Eveningstar." "Dragonspear Castle. All who live within several hundred miles have heard the bame and know its import. Once home to the proud and the brave, it stands now a ruin, cloaked behind a history of murder and diabolic plots. Few go there, for the only reward to be found is death. Rumors abound that Dragonspear holds a portal to the sinister planes, but until now those have been unfounded. Following a great battle against orcs and trolls from the High Moor who had taken possession of the castle, a temple to ward against further evil was established. However, by the Time of Troubles, that temple and its clergy had disappeared. Now, a horde of fiends and monsters has amassed at Dragonspear Castle, and is terrorizing the surrounding countryside. The portal is active, that is for certain. The army of Daggerford needs reinforcements! Is your party made of the stuff of heroes? Hordes of Dragonspear can be played using either the BATTLESYSTEM miniatures rules, or the quick combat resolution system found in DMGR2, The Castle Guide. Alternatively, a few simple changes render the entire module playable without any special rules." "Randal Morn certainly has his hands full! The temple of Lathander, which burned to the ground eight years ago, seems to be the source of a curse affecting the entire town. People are taking ill, animals are dying overnight, crops are failing. All this seems to have started after Eragyn, priestess of Cyric, disappeared from Daggerdale. Shortly before that, a forgotten mage-lord's crypt was discovered and opened; things just haven't been the same since. Constable Tren is displeased with the situation, what with suspicion being cast in the Zhentarim's direction as well as toward Cyric's priesthood. He's undoubtedly making the Dalesfolk's lives more difficult than usual because of this upheaval. Randal has sent out the call for aid to all who are interested and able to help; his freedom riders have their hands full already. A missing evil priestess, a mage-lord's crypt-curse, a plague, and possible Zhentarim involvement: all the elements of a rousing adventure in one place! Where do your characters sign up? Step right this way, won't you?" "Ravening armies sweep across the land! Vast hordes of foul monsters lay siege to mighty cities! Tremendous battles are fought to decide the fate of entire lands -- and you are in command! 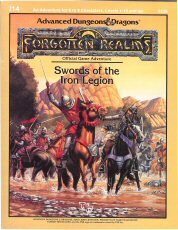 Swords of the Iron Legion is an anthology of adventures set in the FORGOTTEN REALMS campaign setting for large-scale battle using the BATTLESYSTEM rules for mass combat. The adventures, written by a group of talented designers, range from simple skirmishes to all-out wars! Flying creatures, war machines, fortifications, and plenty of other twists ensure that each scenario is more than a simple bash-'em-up. Some adventures also include role-playing opportunities for characters, who get a chance to perform individual heroics to lead their armies to victory! These adventures are suitable for one-time play, or they can be inserted with ease into an existing campaign. 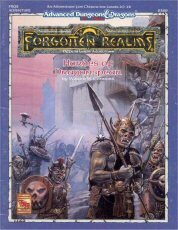 Complete descriptions of the armies, special characters, terrain, and other interesting features to guarantee you hours of fun on a grand scale are included in each adventure." 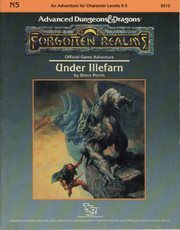 "Under Illefarn is an AD&D® campaign book for a Dungeon Master and four to eight 1st level characters. It is also possible to start as a 0 level character. More about that later. You start as a character in the trading city of Daggerford. By the law of Dagger-ford, you serve in the militia. As a member of the militia, you have the opportunity to participate in several adventures which should enable you to advance in level. When the campaign is over, your character should be at 3rd or 4th level. A split class character may still be at 2nd level for some or all of his or her classes. If you have a character who reached 1st level in N4, Treasure Hunt, your adventure took place in the sea to the west of Daggerford. After that adventure, your character decided to see the world and ended up in Waterdeep, the main trade city to the north. You soon found the big city was a bit much for a simple islander, so you gravitated to the smaller town of Daggerford, finding out only after you settled into a squalid room at the Lady Luck Tavern (or a sumptuous suite at the River Shining Tavern if you've kept most of your loot from the treasure hunt) that residence in Daggerford means enlistment in ... but we'll get to that in a bit."